Do your work in comfort and style with a sophisticated & affordable office chair from our online range. Being comfortable while you work is one of the keys to productivity and the type of seating you have plays an important role in this. 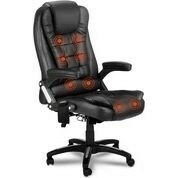 The right chair can support and improve your posture, reduce neck and shoulder stiffness, promote spinal health, reduce pressure on your hips and make it easier to work quickly and effectively. 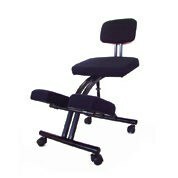 Finding the perfect chair to suit your needs has never been easier with our extensive range of ergonomic office seating. Our online range includes everything from budget friendly mesh back chairs, to top of the range leather executive seats with exquisite detailing. For those willing to experiment with less conventional seating options, ergonomic kneeling chairs are highly effective at taking pressure off the lower back and hips and can be a more comfortable option for those who spend long hours sitting at a desk. Aesthetically, our range of seating is also quite diverse and ranges from the traditional Eames executive style to modern curved back shapes designed to support the spine and neck. So whether you’re looking for an elegant piece of retro inspired seating to complement your study interior, or want specially designed seating to minimise lower back pain, we have products to suit your needs. For more information on our extensive range of workspace furniture including computer desks, boardroom tables and massage office chairs, please don’t hesitate to get in contact with us using the online enquiry form. Browse our online range of seating and accessories by price, brand, or popularity. A number of our products are also eligible for free shipping throughout Australia.